When Fred Cline with his wife relocated their winery to the cool region of Carneros, it was mainly home for Chardonnay, Pinot Noir and Merlot vines then. But Mr. Cline, already experienced with restoring a preserving ancient vine sites and roots, liked to try something else. He brought in a typical Rhône varietals including Syrah, Viognier, Marsanne and Roussanne.In mid 90-ties they had an opportunity to expend to Sonoma Coast – Petaluma, where the climate is very similar to a great region of Alsace, France. Seeing the great potential for growing vines, Cline gladly accepted that challenge as well. Nevertheless, their 140 acres of vineyards in Contra Costa County, where Cline family originally started, remains famous for its ancient vines of Zinfandel, Mourvèdre and Carignane. With the age of vineyards ranging from 80 to 120 years old, these are some of the oldest and most rare grapevines in California. Today, Cline cellars take care and produce several single lots of old vine Zinfandel with distinguish character and many awards under their belt. In my opinion, Cline makes some of the best Zinfandel wines found in California. 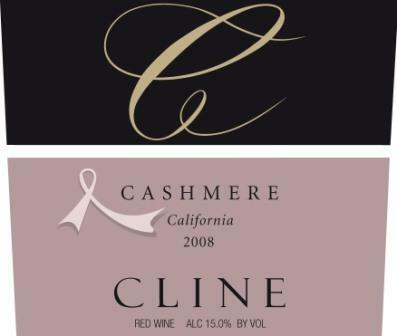 Cline Cashmere, the lovely blend of a traditional Rhône varietals called GSM (Grenache, Syrah, Mourvèdre) was initially created as a wine for an auction lot for the Hospice du Rhône, held in Paso Robles each year. The name evokes smoothness and fluffy velvet (what a smart name for a wine) – and the wine is just that. I am sure that was a main reason why it became so popular. Another good reason to be a fan of this wine is the fact that it became a flag ship for Cline Cellar’s support of Breast Cancer Network of Strenght’s Ride to Empower. The grapes for this blend were harvested separately, according to individual ripeness. After de-stemming and gentle crushing vine fermented in stainless steel tanks with select cultured yeast. Finally, the blend than aged for 9 months in barrels (about 25 % new French oak). Dark ruby color and a lovely aroma of red berries, currant and dark cherries. Smooth and velvety tannins give this fruity wine a body, a little spice and a lot of character. Each of the varietal brings its own potential to the party. Mourvèdre and Grenache gives it a lot of fruit expression, cherry and raspberry, when tannic Syrah brings the depth, hint of chocolate and body. Together with a necessary acidity it makes a perfect concert of flavors. Very well crafted wine that shouldn’t be missed.